The man who used to add credibility and substance to a film, Robert De Niro, has of late made some horrible career moves. For someone who has been in classic films and who created some of the most memorable characters in cinema, being a film god will not leave you unscathed from criticism. His recent string of disasters scream sellout and money whore, yet when I heard he was going behind the camera again I couldn’t help but be intrigued to see if he could right the sinking ship. After all the mixed criticism coming out upon its release, I had felt a bit of trepidation about going to a three-hour movie to just be utterly bored, but fortunately this was not the case. In fact it was just the opposite, as the movie flew by at a nice pace spanning its thirty years of history. 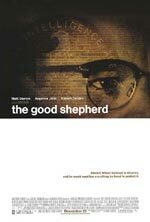 The Good Shepherd tells the story of Edward Wilson and his ascent in the ranks of the CIA’s Counter-Intelligence division. This stoic Yale graduate found himself at the cusp of war with an offer to help serve his country, and, as is shown throughout, the call of country and brotherhood will always supercede that of God and family. Wilson’s life becomes so caught up in his job, which was necessary to keep his country thriving throughout World War II and the Cold War that all his personal attachments slowly deteriorate. Wilson loves his son, but only with his heart left over from loving the values his country gives him. A true utilitarian, he doesn’t have the ability to side with a single person when the whole of America’s fate lies in the balance. He is a man of strong convictions and controlled actions, and although it seems his life has destroyed that of those close to him, it was in fact his own life he destroyed so many years ago. I give De Niro much credit for delving into a subject as ambitious as the start of the CIA in just his second feature film, (I know he is considered an uncredited director on The Score, but I still attribute that to Frank Oz). Not only is this subject matter complicated and shrouded in mystery, the structure of the script is one of shifting years and flashbacks. We begin in 1961 as the Bay of Pigs Invasion fails miserably because of a breach in intelligence. The duration of the film shows us how Edward Wilson has gotten to the point of being lead on a failed mission, and to solving the question of who turned their back on the country. Wilson is played magnificently by Matt Damon, his emotions always held close and, while etched in his features, always bottled inside. This nuanced performance truly encompasses the character’s conflicted nature between serving himself and serving his nation. His evolution from an ambitious college student playing women’s roles in plays to the hardened man able to see the enemy as a statistic is heartbreaking, especially as we see those few people who tried to save him from his path of eventually solitude. Being such a long film, spanning three decades of history, there are many supporting players coming in and out of view. Most do an admirable job in keeping appearances up by playing against Damon at multiple points in his life. Michael Gambon deserves notice as a man who worked in the business yet knew what it could do in destroying any chance of love in one’s life. He knew how life would end if he didn’t give his all to the job, but didn’t care about the consequences when the alternative was turning himself off to life’s pleasures and beauty. Angelina Jolie surprised me in her role as Damon’s wife. Her emotional range was vast and she played it nuanced enough for the audience to be able to feel for her plight. However, while Jolie did well, her female counterpart Tammy Blanchard truly stole the show. I had never heard of her before checking into people’s reactions about the film. Many said how good Blanchard was, and after seeing for myself, I can’t do anything but agree. She is the true love of Damon’s character, a beautiful romantic who’s deafness never stood in the way of how they felt for each other. Her innocence is a metaphor for the film and Edward Wilson’s journey through it. Once she was removed from his life, humanity was lost forever. While the story was wonderfully constructed and perfectly revealed its motives, it was not a perfect film. I don’t pin its failures on any one person, however, but instead on its epic scale. Maybe De Niro is to blame for not using different actors in portraying Damon and Jolie’s characters in younger years, but the aging process used was not believable. As shown in 1960, they are done up nicely, wrinkled and etched with the pain of a long fifty years of life. The real trouble is in the early scenes. While Damon probably could have passed as a college student in the 30’s, the filmmakers decide to use his natural look for the 40’s and try to make him look younger with a badly done hairdo for the college years. As for Jolie, they decide to use her natural look for the 30’s and end up making it look like a 35 year old is hitting on a 20 year old. I also think, while Billy Crudup is great casting as an intelligence agent, he is a horrible selection as a British intelligence agent. The accent is horrid and one of the few blemishes acting wise here. My main criticism, though, is the length. Yes, the time flew by as I became enthralled in the story, but it still could have been tightened up. There are many scenes that could have been excised without losing any insight into the proceedings. The most blatant moment was the five-minute scene that brought the great Joe Pesci out of retirement. Besides the final line by Damon, (which could have been put somewhere else, as it was a great line), the whole scene appears to be there only to show Pesci off and does little to advance the plot. Besides these minor squabbles, The Good Shepherd is a remarkable film. 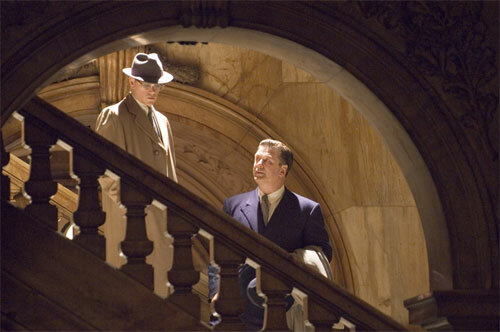 Many speak badly about it, as the action is not there, there is little espionage and spy genre aspects, etc. This film is not a spy film, but instead a human portrait of a man who slowly watching himself go down a path that his father went down. In living his life for his country he never allowed himself to live his life for himself. While America was able to flourish his own love for life was stunted and he could do nothing but watch everything good in it slowly fade into the past.